Welcome to more of our easy fall craft ideas for kids. 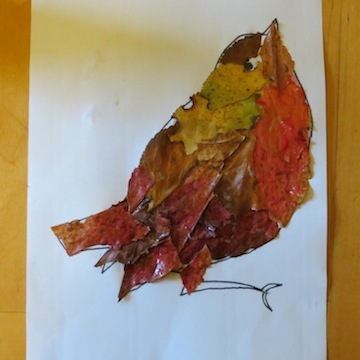 Try decorating a Robin Red-Breast with leaves, make leaf puppets or develop your kid's cutting skills by framing leaves to make great autumnal decorations. This is one of our most popular and beautiful fall craft ideas for kids. We always get comments when we do this. 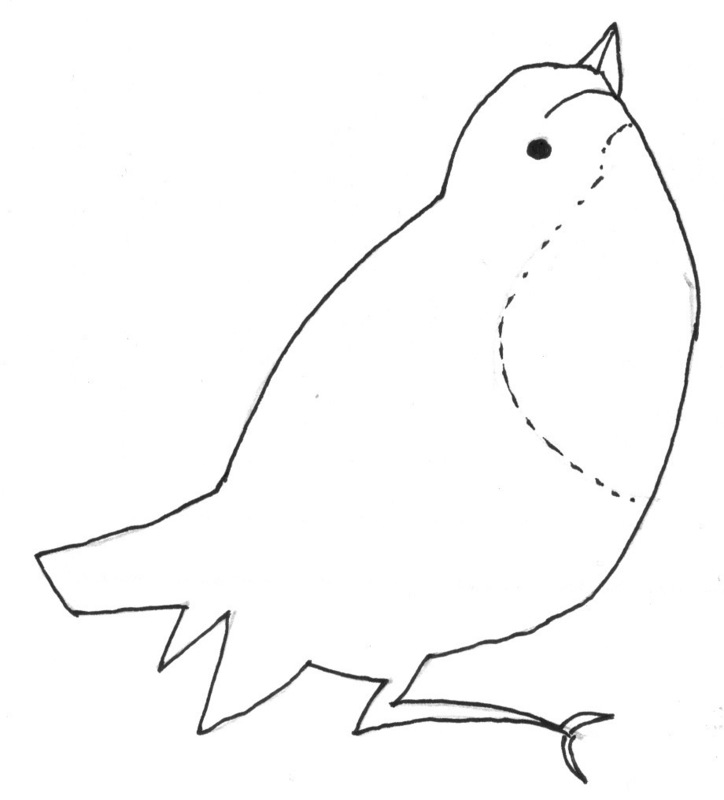 You can also use the Robin template for as a colouring-in page too! 1. 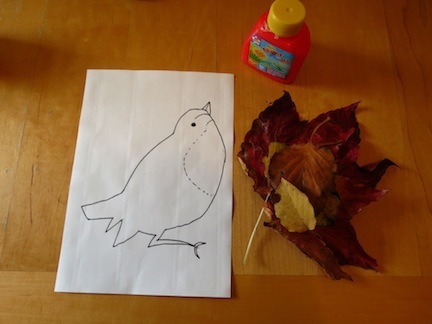 Gather some autumn leaves and print out your robin template using the PDF above. You can print the template onto ordinary paper or onto card stock - this will make the finished piece more stable. You could even print on different coloured cards. 2. 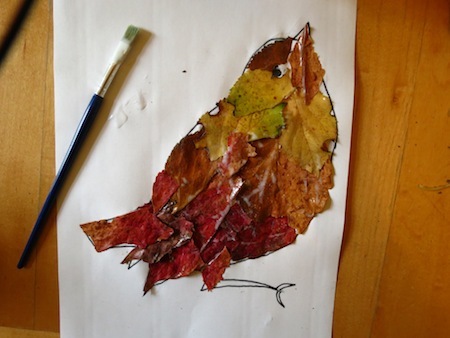 Take your glue and brush and paste the leaves into the robin, overlapping and until the entire outline has been filled. 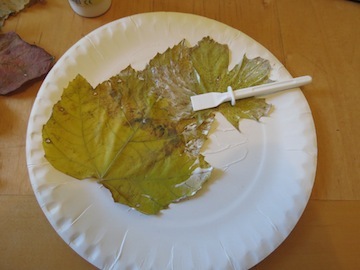 Use a lot of glue to make sure the leaves are stuck down well. 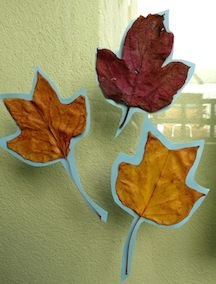 TIP: Encourage your kids to spot how the different shapes of the leaves might fit into the outline. You can see in our picture that we ended up using the tips of leaves for the tail and the rounded sides of leaves for the breast and head. We also ripped leaves up where necessary. 3. When the glue is dry, dab some red paint onto a brush and smear it over the leaves onto the Robin's breast. Use your black pen to mark in the eyes. 2. 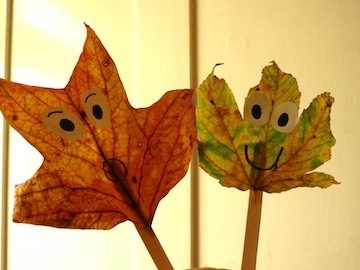 Make Leaf Puppets - quick, easy and great fun! Popsicle sticks - as many as the number of puppets you want to make. 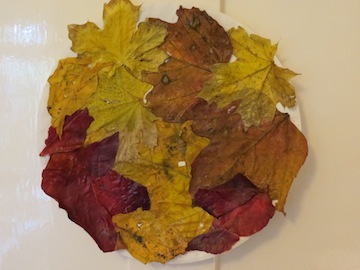 Autumn leaves - dry enough to hold their shape but not all dry and crinkly! 1. Choose a variety of nice leaves that you want to use as your puppets. You can make as many as you like! 2. Cut out two ovals from white paper for the eyes and colour the middle in black. Draw on a mouth if you like. 3. Glue the eyes onto the top of the leaf and glue a popsicle stick behind. Hold it down firmly to dry. TIP: Why not make a whole collection of these puppets. Kids love imaginative play and could use these are little characters in a story! The following two crafts are for those of you looking for really easy fall craft ideas for kids at nursery or preschool as well as at home. 1. Go outside with your child and have fun gathering lots of different types of leaves. 2. 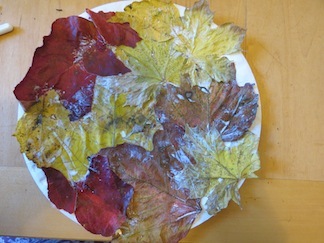 Cover a paper plate in glue and start sticking leaves down using a glue stick. 3. 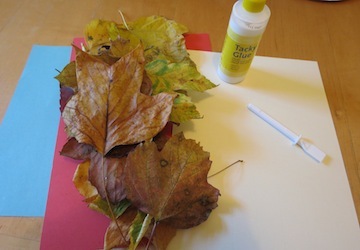 Spread glue on top of the stuck-down leaves to make sure they are firmly secure. 4. Leave the plate and leaves to dry properly. This is really easy fall craft idea for kids which enables them to develop their cutting out skills and can be completed easily with larger groups. 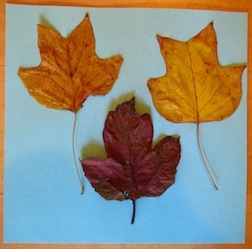 A range of autumn leaves. 2. Stick a number of different leaves onto your chosen card. Let them dry. Then take your scissors and cut round the leaves leaving a small border of card showing. 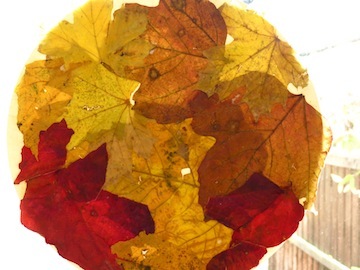 Stick them to a window or mount them on more card stock to make autumnal-flavoured cards for mum or dad!